First to my wonderful husband Bruce! 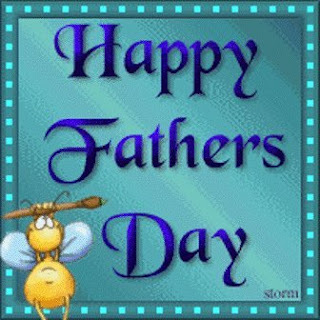 Happy Father's Day to you. Our girls are lucky to have you as their Dad! You are so good with them. They love when you get home from work and know that you're home every night it's awesome! Snuggle times are big in our house, somedays we need a kingsize bed for all of us to fit in it. You work very hard to support us, so I can stay home with the girls. We are a lucky set of girls to have you as a Dad and we love you. Then there is my Dad. It has been 11 years now since he has been gone. He's missed every day. He only got the chance to meet 3 out 7 grandkids. My Dad was a good, kind hearted man. He had such a laugh, and how he loved to laugh. So Happy Father's Day to these great men. You are both loved. THAT IS SUCH A CUTE PICTURE!!! I WANT I WANT!!! LOL. Happy Father's Day to your wonderful husband. Now ... was that comment about walking in your blog a statement of intention? Are you telling me that you ARE going to walk or that you SHOULD walk? I dare you to walk every day for one week. It's great for my sanity ... gives me a chance to think without interruptions. Double Dog Dare ya'! ! !